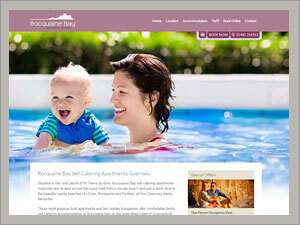 Rocquaine Bay Self Catering Apartments Guernsey. Web Design by Bazil Guernsey. These eight purpose built apartments and two holiday bungalows offer comfortable family self catering accommodation at Rocquaine Bay on the quiet West coast of Guernsey all year round. Rocquaine Bay self catering apartments Guernsey are located just a short stroll from the beautiful sandy beaches of L'Eree, Rocquaine and Portelet. This popular 3 Star destination offers: car parking, free WiFi internet, a children's play area, swimming pool, sauna and a games room. Site designed, maintained and hosted by Web Design by Bazil.